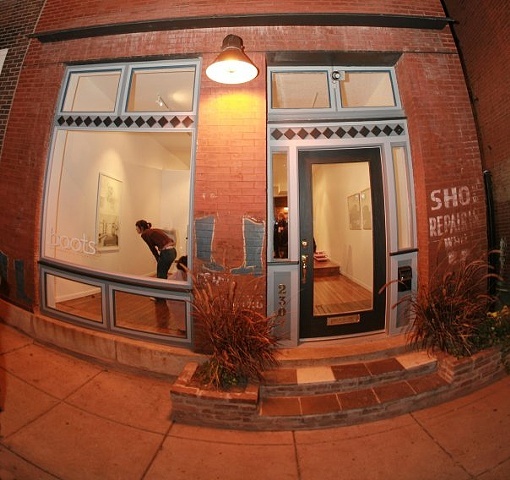 Boots Contemporary Art Space is 501(c)3 non-profit art-laboratory on the south side of Saint Louis, Missouri. Located in the historic Antique Row District on Cherokee Street, this shotgun brick building was once a shoe repair shop in the early 1900’s. The fading images of boots on the storefront served as the inspiration for the name. As an artist run space our mission is to provide emerging to mid-career artists and curators, local, national, and international, with an art lab that will support them in creating and showcasing new work. Through programming and exhibitions we attempt to stimulate a creative dialogue between the Saint Louis art community and the contemporary art world.